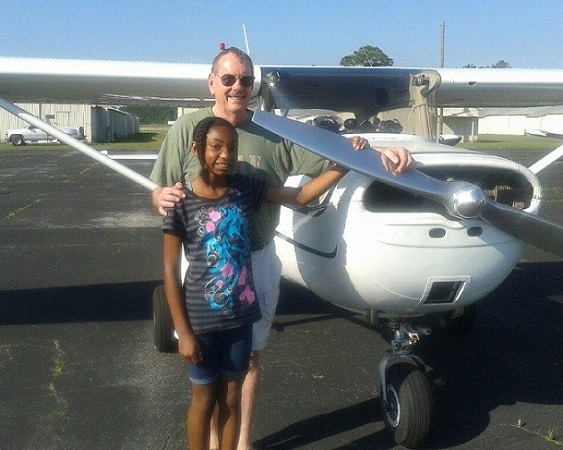 The Stephen M. Price Foundation has joined efforts with Teens-In-Flight to expand the "Young Aviators" program into new areas of aviation education. To view the Teens-In-Flight website, click here. 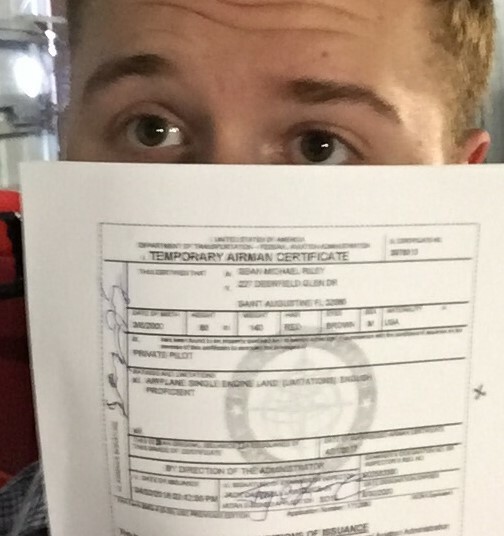 Sean proudly displays his airman certificate after months of study and hard work. 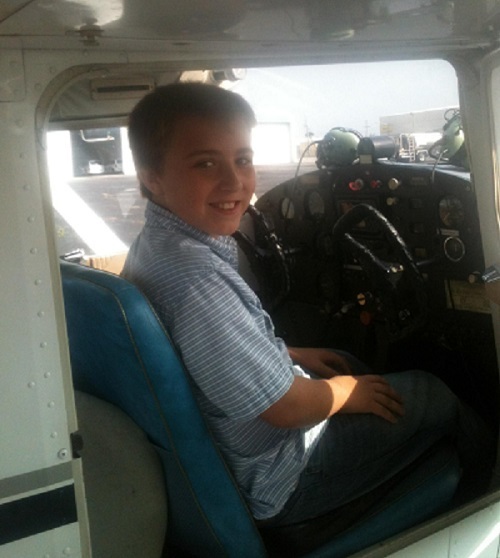 Sean began his aviation journey when he was only twelve years of age. Now the sky is the limit. Sean learns there are no shortcuts to our pilot training programs. Flying is only part of what you need to know to be a good pilot. 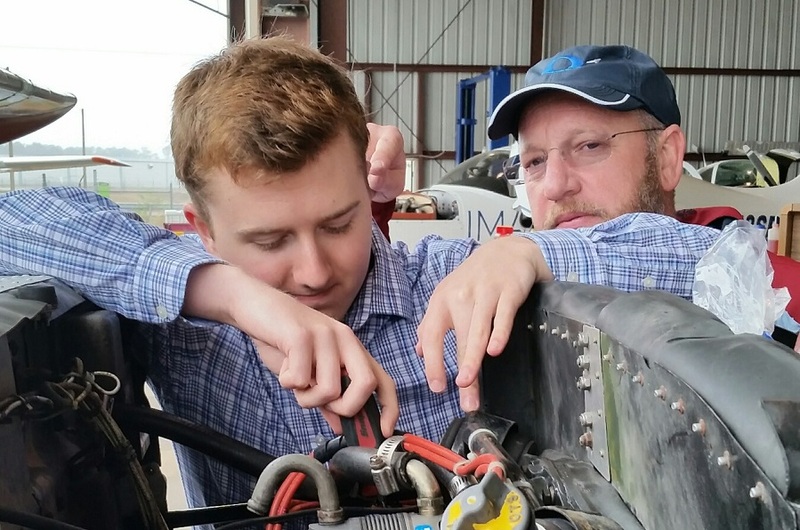 Joel gives Sean a lesson in how to keep the airplane flying safely with proper inspections and maintenance procedures. The mechanics at Corporate Aircraft Maintenance keep our birds in top condition. Safety is our priority. Sean Riley gets a Scholarship. Now its time to get to work! Hunter progressed from our flight club at Kings Trail into Private Pilot training at the hangar classroom at Craig Airport. He is moving along at a comfortable pace and we expect that he will make a fine pilot. Here he explains procedures for a particular flight assignment before takeoff in the Bonanza. Good job Hunter. The Kings Trail Flight Club after their Final Ground School test. 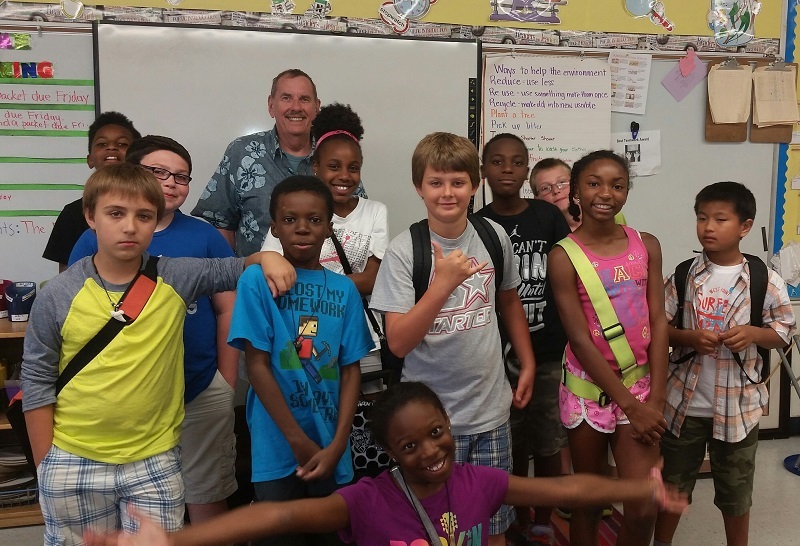 This class worked hard and made the grade! It wasn't easy, but nothing worthwhile usually is. On Memorial Day we had our hangar party at Craig Airport and did a lot more flying. What a fun day. Hamburgers and hotdogs on the grill. good weather, another great day for everyone. 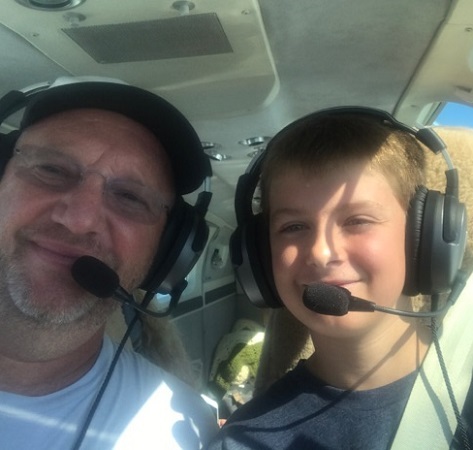 We congratulate Hunter Hilton for received the Young Aviators "Top Gun" award for his high test scores and his flying skills. Caudia Oates makes her first flight while at the controls. After an demanding ground school, with high grades, Caudia gets to take her up and show what she has learned. Good control and focus, she will make a fine pilot. Stevo straps in for his first ride. He didn't get far as some unexpected thunderstorms closed in and we made a hasty retreat before the airport went IFR. Today Jamie got his wings. He was high score on our last exam and now gets to show what he has learned in class. We have 25 students and, so far, he is "Top Gun" but it is close. 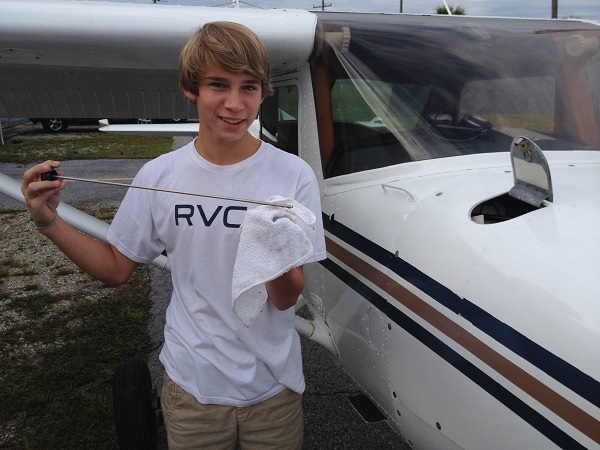 Our newest pilot cadet is Jacob Ridings shown checking the oil in the Cessna 150 during his first preflight and with Chief Instructor Joel Weaner on his first flight. Jacob did an excellent job and will make a fine pilot. 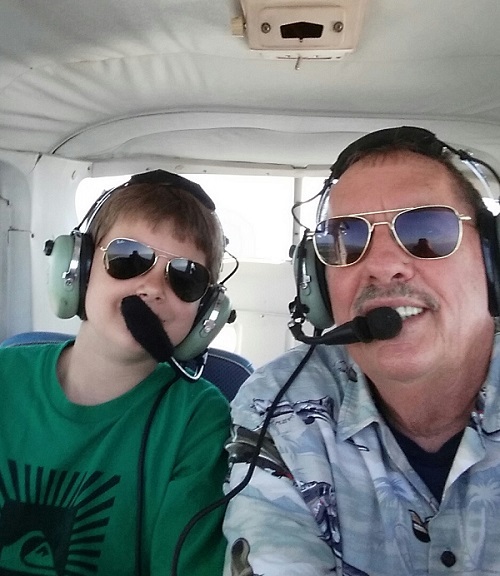 Jo-Jo takes his check-ride with FAA DPE Duane Brown. 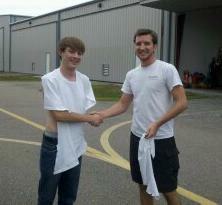 Another Private Pilot gets his wings. Good job Jo-Jo. The smile says it all. Congratulations to Austin Toth, Giovanni Gonzalez, Ryan Peeling, Savannah Dubuc and Daniel Minami for passing the FAA Private Pilot Ground School written exam. 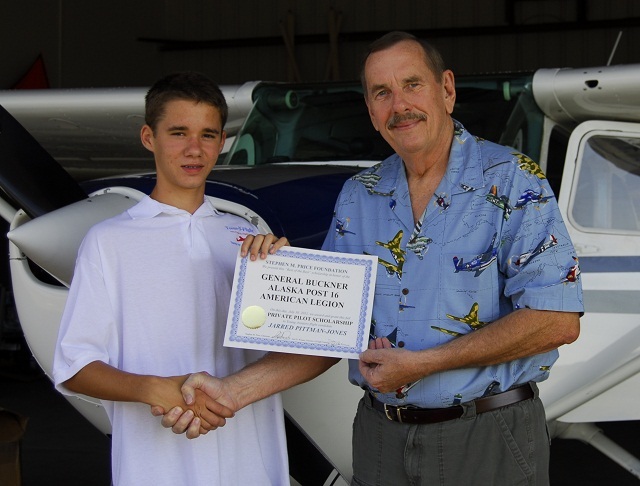 Joseph Kirkwood solos and is congratulated by his flight instructor Brian Bertka. Brian is shown with Jo-Jo after the ceremonial cutting of his shirt. A job well done by both Jo-Jo and Brian. 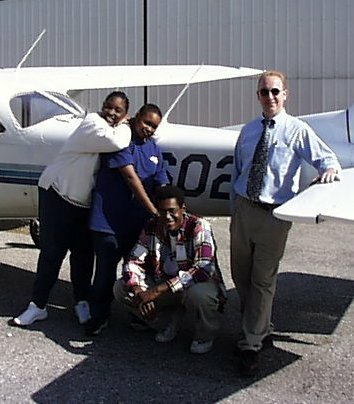 Brian has donated many CFI hours to our students and has made a difference in the lives of our kids. Thank you Brian! Lt. Colonel Michael Clifton from Sandalwood High School presents flight training awards to Air Force JROTC cadets Shelby Clark and Nelson Cabanatan. 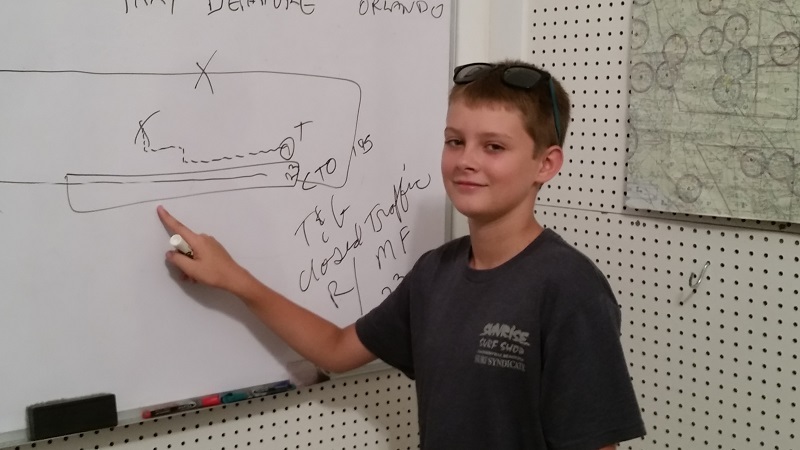 Both cadets received their first flight training lesson from Master Instructor Joel Weaner. You can tell they had a good time. On October 15, 2011 The Price Foundation was proud to host and celebrated Military Appreciation Day at Craig Airport in Jacksonville. Everything went perfectly for our event. The weather was beautiful and the kids from Sandalwood Air Force JROTC were all very excited to be in the Young Eagles program and ready to begin their aviation education. We flew 86 young people and many of their parents as well. Our route of flight was north to Dames Point, down over the Gator Bowl, south around the antenna farm, over Town Center and north to Craig Airport. It was the busiest day Craig Airport had seen in some time. No one got sick and all wanted to go again. The American Legion was cooking hamburgers and hot dogs and everyone had a great time. We have 13 kids that registered but couldn't make it to the event. We will be flying those kids over the next few weeks. We thank Sky Harbor Aviation for the use of their facilities and American Legion for their support for the kids in our community. The EAA provided computers and personnel to register our new Young Eagles and many others were involved as well. Next year we will do it again. EAA president Rod Hightower with Elif in front of his warbird. Elif and Steve get ready to take the Cessna 150 up for some spin training. 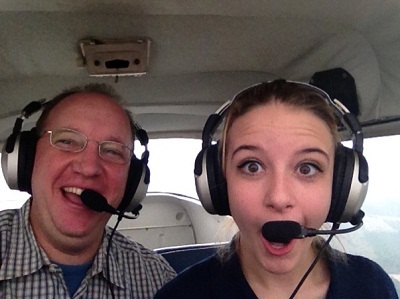 Elif "Zoom" laughs at her CFI. "Collin, can you even fit into this little C150?" 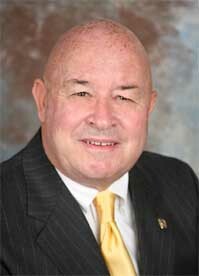 Colin is an excellent instructor and has donated much time to the kids. Joseph "Jo-Jo", the newest cadet in the program gets ready for a flight. Jo-Jo is a talented musician playing both drums and guitar. Now he is a "flying" musician. 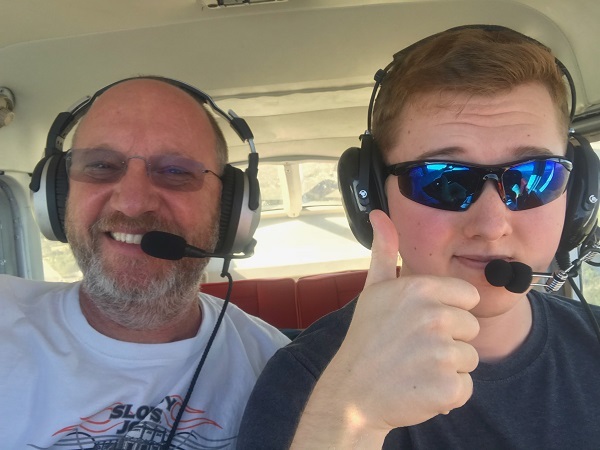 The "General Buckner AK Post 16 Scholarship" provides Jarred all flight training materials and supplies, and all of the flight time and ground school necessary to earn his FAA Private Pilot Certificate. 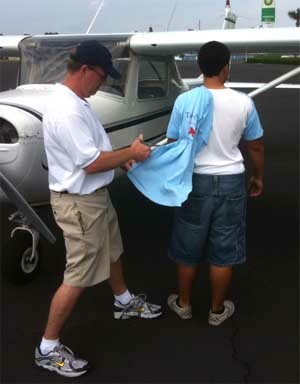 It also covers FAA medical exams and all FAA testing and certification expenses. Jarred is on his way. Joel Weaner cuts Ivan's shirt after his first solo on his 16th birthday. 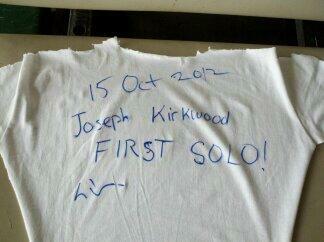 Ivan flew solo in 3 different birds on his birthday (PA-17 (Vagabond), C-150, and C-172). 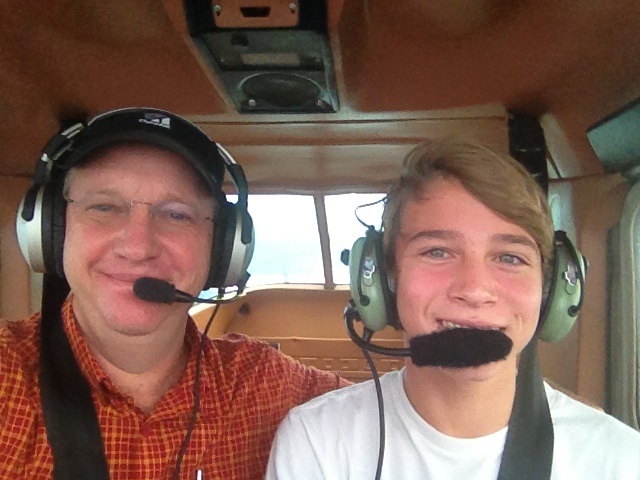 FAA regulations require a student pilot be 16 years of age before he can make the first solo flight. 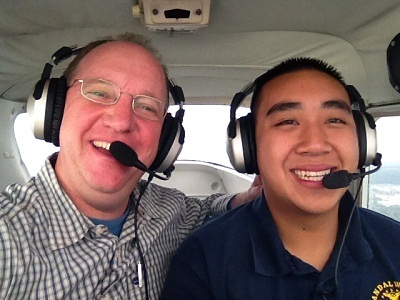 Ivan has been in the Young Aviators program since he was 11 years of age and has 200 hours dual instruction. He is a darn good pilot. 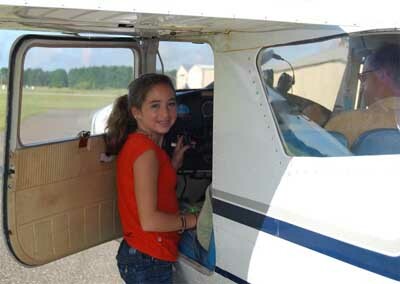 Elif gets ready for her first flight lesson. Elif is the youngest candidate ever accepted into our program at only eleven years of age. Her desire to be a Coast Guard rescue pilot, and her dedication to aviation education was a determining factor in her selection. Ivan and Elif cleaning the airplane after a day of flying. Ivan has propeller duty and Elif works on the belly. 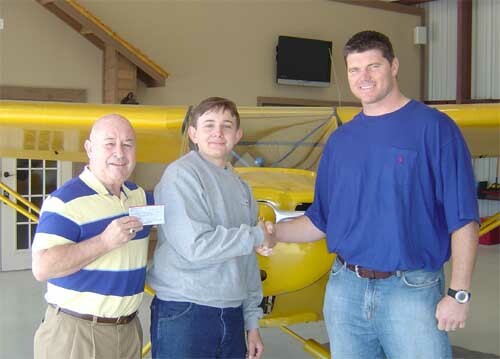 Jack Howell presents the first "Young Aviators" grant check to Jarrod Archambo as Kyle Brady gives congratulations. Jarrod loves aviation and is eager to learn. He has been in the program about a year and has about 10 hours in his logbook. At 13 he is our youngest cadet. He is a good stick we expect him to solo in a glider when he turns fourteen. 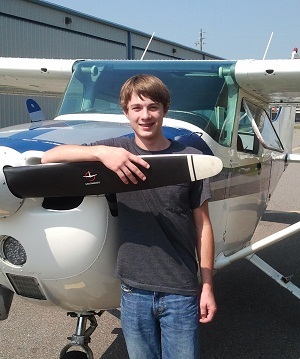 The FAA rules prohibit him from soloing in our powered aircraft until he turns 16, but will allow him to solo in a glider at 14. Becoming a PILOT at 14... that is his dream. We will make it happen. KRISTOFF NAMED "STUDENT OF THE YEAR"
Kristoff named Jacksonville's "Student of the Year" and is congratulated by Kyle Brady for his accomplishment. Hard work and dedication to aviation excellence has paid off for Kristoff. He proudly shows his pilots' logbook to football legend Kyle Brady who is also an accomplished pilot and aircraft owner. 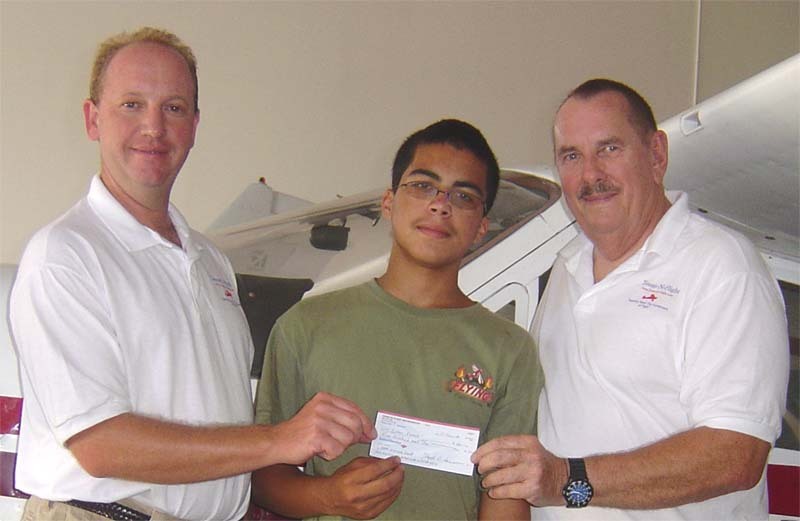 Joel Weaner (left) and Stephen Price present Ivan Ramos with a grant check from Teens-in-Flight for the EAA Summer Camp. Ivan has been in the Young Aviators program for several years and was our Student of the Year several times. We are proud of Ivan, a very good pilot and a fine young man. 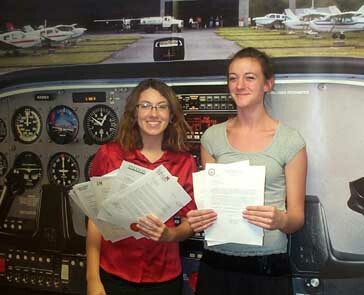 Flagler Teens-In-Flight seniors with their college scholarship offers. 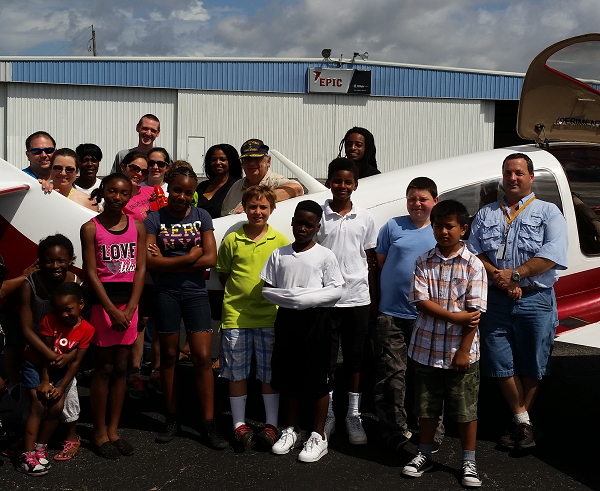 Teens-In-Flight has assisted these students in their scholarship endeavors through our supporters and friends. President Jack Howell proudly stands with four of our students that have excelled in the program. 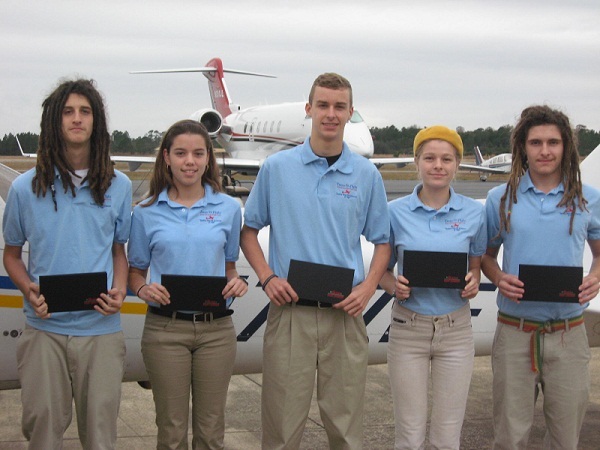 These student have received college scholarships to continue their aviation education beyond the scope of Teens-in-Flight. We congratulate them on their hard work and dedication to aviation excellence. We are blessed to be part of their lives. Two girls with a bright future. 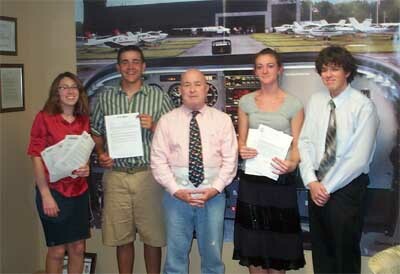 Emery Riddle Aeronautical University bound students. To the left is Chris Carr and Foster Diebold. 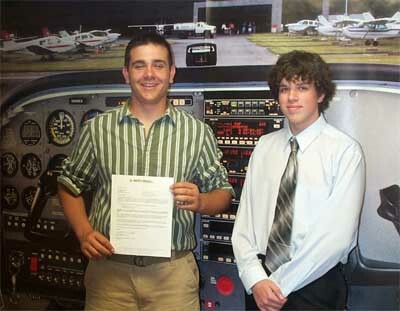 Both have received aviation scholarships to Emery Riddle Aeronautical University. These guys are good. We are happy to announce the grant of five scholarships to deserving students in the city of Accra in the country of Ghana on the west coast of Africa. The grants will be for studies in the needed fields of healthcare and the sciences. In my trips to Ghana, I have meet many young people trying to make a better life for themselves and their families. These grants are not in our theme of aviation education, but is appropriate for the situation and area. For more on my trip to Africa click here. We congratulate Kenita Horsley, Keith Horsley, and Brenton Stowers. After passing the ground school part of the "Introduction to Aviation Program", and demonstrating standard flight maneuvers, our cadets were graduated as Cadets Third Class. Here are pictures of our cadets as they learn the preflight checklist with their instructor, our "Director of Flight Training", Mr. Joel Weaner. The cadets are preparing for their first cross-country flight. After an intensive preflight inspection, it was off on our cross country route that began with Brenton at the stick. He flew the first leg of our flight, Craig Airport to St. Marys Georgia. After a brief tour of the facility and a flight debriefing it was Keith's turn to demonstrate his flight skills on the second leg of our journey, St. Marys to Herlong Airport in Jacksonville. After the flight debriefing and a facility tour, it was off on the final leg to Craig Airport with Kenita at the stick. Kenita flew along the river, with a few turns around the stadium for good luck, and made her landing at Craig. We're very proud of our cadets and their aviation achievements.